The recent release of the 2019 Trip Advisor Travellers Choice Awards came with much excitement until trepidation crept in (more about this later). Treasury on Collins Apartment Hotel took the pinnacle no.1 position as top ranked Hotel in Melbourne ahead of Crown Towers and Larwill Art Series Hotel. The awards acknowledge only the top 1% of hotels and are based on traveller reviews, opinions and critiques, it is an accolade that has been judged by past guests and not paid ‘experts’. This makes the award genuine and very rewarding, yet what came as an accolade could end up making Melbourne’s Hidden Gem not so hidden any more. 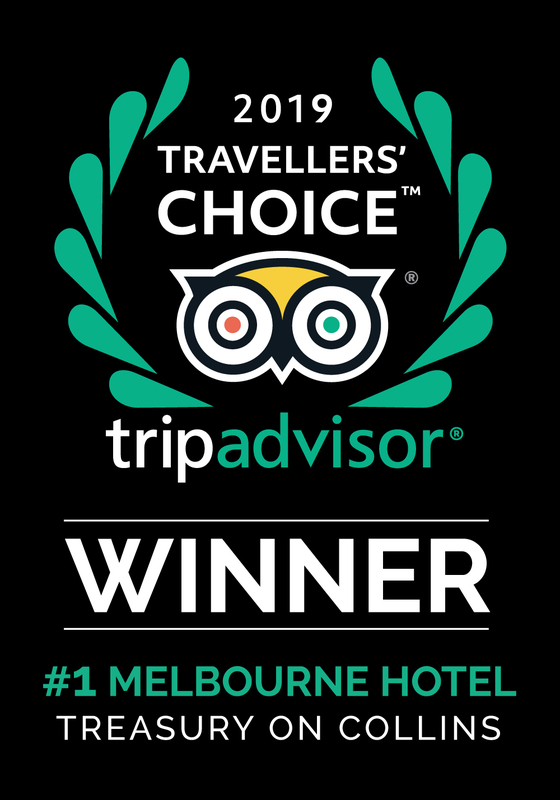 Treasury on Collins has enjoyed the position of no.1 hotel in Melbourne on Trip Advisor since September 2018, which has surprised its 5-star competitors, the hospitality industry but most of all the hotel itself “The first time we reached the number 1 spot was back in April 2018 …. it was fleeting. We regained the top position in September and anticipated another fleeting moment but we have remained at number 1 for over four months now. This has surprised and humbled us, it is a position we don’t take for granted. We value our guest’s reviews and their many suggestions.’ said John Domjan, Front Office Manager. With this new spotlight on Treasury on Collins, demand may increase, but rates will remain competitive and not at a break-your-budget distant reach. The book direct Perks (including a welcoming guest lounge and free flowing wine) will remain the hotel’s signature feature and providing guests a personalised experience will not be compromised. Whilst Treasury on Collins may no longer be so hidden, it will remain a Melbourne gem. For more information on the top hotels in Australia visit Travellers Choice Top Hotels and Travellers Choice Best Service.